A Canadian coroner will investigate the 2012 stage collapse that led to the death of a Radiohead drum technician. Ontario's coroner opened an inquiry on Thursday into the death of UK citizen Scott Johnson on 16 June 2012. This September, a court stayed charges against the concert's organisers because of trial delays. 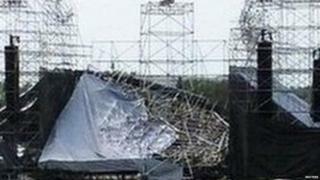 The victim's family have called for an inquest to uncover who was responsible for the stage collapsing hours before the concert in Toronto. "They seem to have forgotten Scott in all this," Johnson's mother Sue Johnson told the CBC. "They seem to forget that Scott lost his life because somebody made a mistake." Radiohead were set to perform a sold-out show at Toronto's Downsview Park when the stage's metal scaffolding suddenly collapsed. Johnson, the band's drum technician, was killed and three others were injured. A year later, police filed charges under Ontario's health and safety laws against entertainment company Live Nation, engineer Domenic Cugliari and contractor Optex Staging and Service. But those charges were stayed this September because of a landmark 2016 Supreme Court of Canada ruling that said excessive court delays violate the rights of citizens for a fair trial. All three defendants had pleaded not guilty. Radiohead drummer Philip Selway told the CBC he hopes the inquiry would help bring the family closure. "When the collapse happened, it happened at four in the afternoon. Our soundcheck was due to start at four and I actually should have been where Scott was." Mr Selway told the CBC. "That is an incredible weight, and personally I can't let this lie. I want to see a proper conclusion, something that is respectful to Scott."